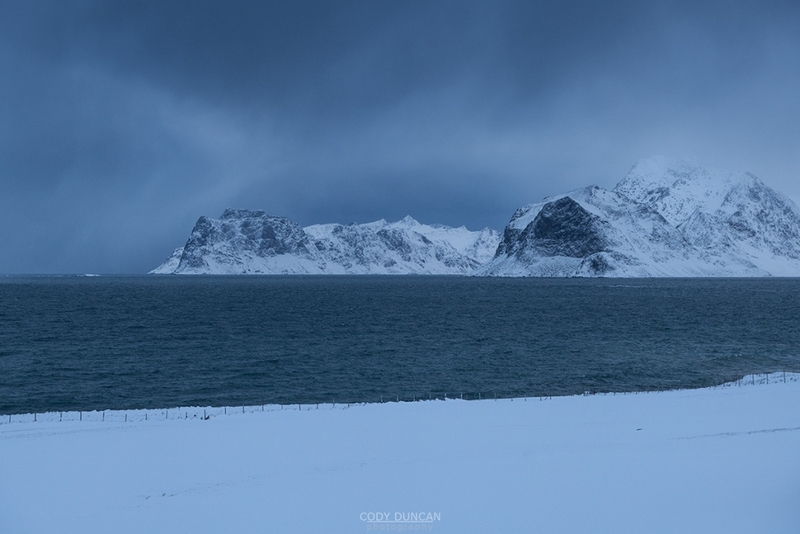 After last weeks relatively warm storm stripped most of west Lofoten of it’s snow, the past week has been making up for lost time! 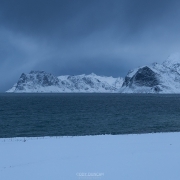 After several days of heavy snowfall now and high winds, it is snow chaos on much of Lofoten. I even had trouble getting home last night and had to leave my van stuck in a snow drift until my neighbour could clear the road and pull me out with his tractor this morning. In conditions like the last days, it is best to avoid driving, especially at night, if you are unfamiliar with the roads. The roads are slippery, narrow, and snow drifts can for unexpectedly and quickly in places. Wait till the storm clears, much nicer looking anyhow. You won’t have much to photograph if your car is stuck in a ditch off the side of the road. The weather forecasting has also been quite unreliable in this last week, due to the constantly changing conditions. Best accuracy is to look at the actual radar image. Yesterday was supposed to have been somewhat sunny actually, according to the forecast on Wednesday. But it turned into a full winter storm, blasting straight down over Vestvågøy the entire day. Tuesday and Wednesday were also my first to days on skis this season. It’s still quite dark here and I’m in Norwegian class until 12:30 or so during the week, so only had time to go up a small hill near leknes. But it’s nice to have the legs moving again! Yesterdays trip was canceled due to the weather, and the same for today – though it has actually cleared a little, and i might have been able to make it. I can feel the days are getting lighter, but I’ve only just caught a quick glimpse of the sun while driving to Leknes on Wednesday. So I’m still waiting for my first opportunity to photograph it again! With my first photo tour of the winter season beginning tomorrow, I should have plenty of opportunities – weather cooperating!